I'm sure babywearing is not an actual competitive sport, but I'm convinced if it was, this mama possum would take home a prize. 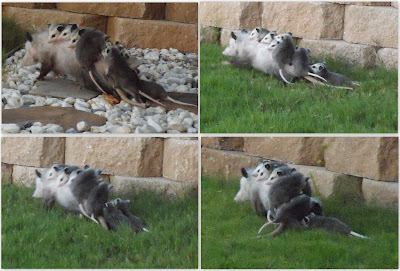 My parents watched this possum family struggle through their yard one morning while I was oblivious upstairs. I'm so sorry I missed it! I really can't stand possums, but I think it would've been so cool to see that. Got to give those last two hanging on the end an A for effort! My mom said the babies kept falling off and running back to hop on again. The mother was struggling to stand and walk, her legs kept buckling under her! Aww they're actually kind of cute. Kind of. She needs a baby bjorn! Poor possum, I can only imagine. That would have been amazing to see. Oh how cute! Mother Nature does it again. Hilarious. That is one patient mama. I agree with Amy...I have memories of a vicious possum on the back steps when I was a kid; but this was indeed a cool thing to see! Hahaha. This made me laugh so hard. Too cute! When I was young my mom found a mama possum that was run over. One of the babies was still alive. It could actually fit in the palm of your hand. She nursed it and he was our pet. The coolest animal ever. Imo was not too good news for today, but not surprising they have to learn to begin to comply with rules, they have two fake results, none of them is genuine.